If you've ever played Dungeon Crawl: Stone Soup, you are familiar with how this kind of online (ssh only for now) game server works. You connect to the server lobby, log in to your account, then select the game version you want to play. 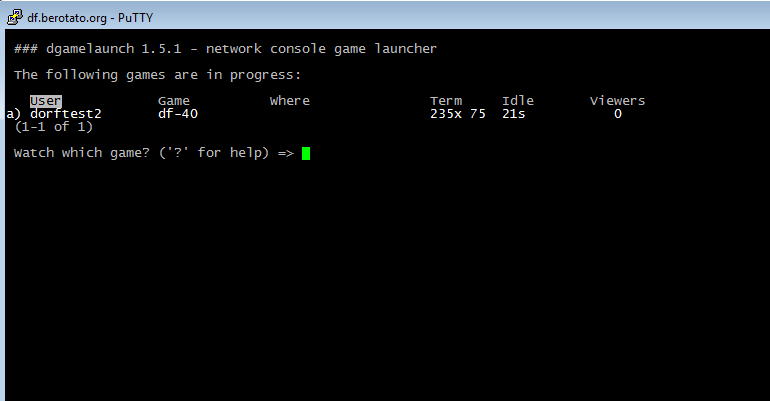 The game server fetches the version you requested and off you go to play it. Other people connected to the lobby can even watch you play, LIVE. 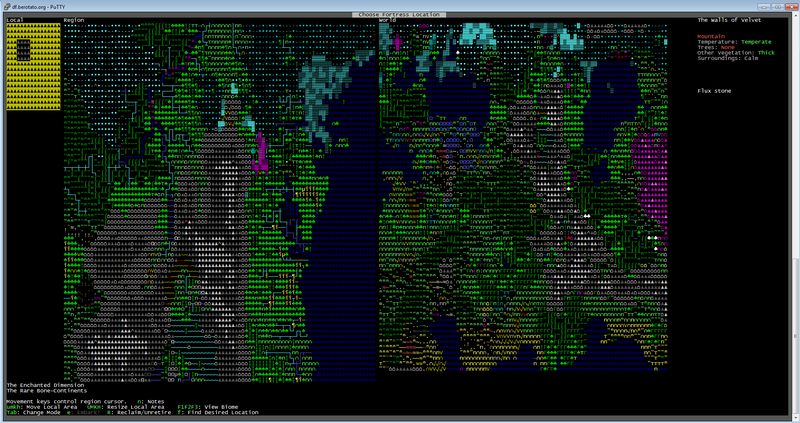 I've used the crawl setup as a template to get Dwarf Fortress working the same way. Connect to the lobby, log in, select DF version, and the server does some behind-the-scenes magic to serve you the game and add you to the current games list in the lobby. It's pretty rough so far, but it (mostly) works. If things look 'funny' you may need to tweak your ssh client. I also like to set my window size to 240 x 75 (3 times the default DF of 80x25) and allow resizing. I consider this a prototype rather than a nicely polished "production" solution. It works, but there's a lot of rough spots still. The biggest is the resource overhead. DF likes to peg my VPS processor to 100%. For this reason I've had to limit the number of simultaneous players on my server. I don't plan on working much on developing the idea further. I'm looking at some alternative options for DorfServer 2.0, but those are long-term plans. I want to share what I've been able to get working with folks who may be interested in adopting it or taking it further. Ideally, someone far smarter than I can address some of the rough spots I wasn't able to polish and can afford to throw more hardware to power a bigger server (and have the time to properly admin it). Please go nuts and do whatever you feel you need to do to make this work better. I'm not an expert on the dgamelaunch stuff, but I do run a (the smallest) official Crawl Server, so I do have a bit of background. I leaned heavily on the other Crawl server admins for help when setting this up for DF, so don't hesitate to ask questions if you get stuck. I'm noticing the bot isn't working like it is supposed to so I'll have to look into that over the next week or so to figure out what's going on. There's also a lot of warning messages flying by the screen when you start up new games. Since the game starts and allows you to play, I'm assuming these warnings are TOTALLY FINE to ignore. NOTE: I hacked this together pretty crudely. It works but I had to continually wrestle with stupid typos in the dgamelaunch config files along with multiple file system permission issues. Definitely use at your own risk. 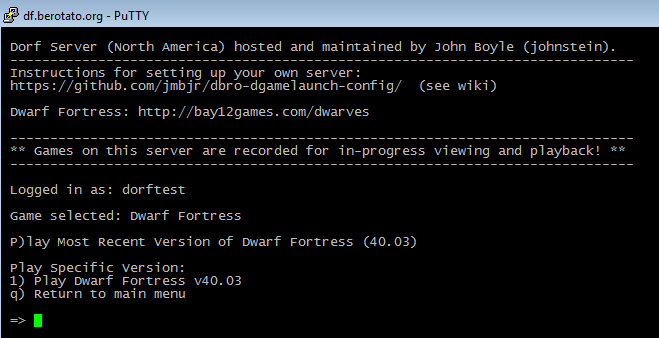 Basically, this is a ssh/console based dwarf fortress server that allows folks to log in, fire up a game and play via ssh and let their friends watch. There's an IRC bot that spins up for each player that will announce some interesting milestones based on the gamelog. This is HEAVILY based on dgamelaunch-powered Dungeon Crawl Stone Soup setup. The main difference is the addition of the dfdir and the lack of using dgl to properly manage and install new DF versions. This could be added. The dwizzell bot needs some serious work. It parrots gamelog events to an IRC channel (similar to the crawl bots which it is heavily based on). The issue is, the DF gamelog isn't really formatted for use in milestone announcement. A better solution (I think) would be to parse the gamelog into a more sane format. Maybe you could hack soundsense to write a nicely formatted line to a common gamelog file (rather than playing a sound). Then you could replace all the individual dwizzell bots with a single annoucement bot (similar to how crawl does it). DF is a CPU hog. World Gen pegged my VPS pretty bad so I added a way for the server admin to upload worlds to a templates folder that get copied to new player folders. This way the server admin can encourage players to not kill the server and just use a pregenerated world. I didn't know how to disable world gen.
Dgamelaunch uses TTYRECs to allow watching of the games. For crawl, it looks for certain codes in the TTYREC to know at which point to start letting the watchers watch. Thing is, these aren't the same codes for DF so when you start watching a DF game, you start watching from the beginning. This is interesting but there's probably a much better solution. I wanted to add a way to allow players to edit their init files. 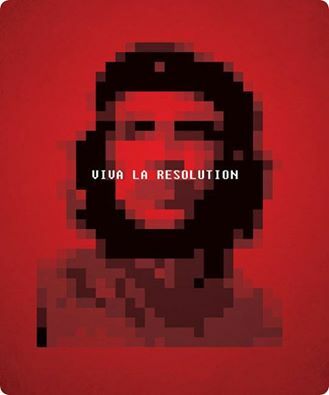 This wouldn't be difficult with ee and virus (which come along with the dgamelaunch setup). I just never prioritized it. The install scripts try to set the basic init options, like TEXT mode and setting the window size and turning off sound. But it could be useful (potentially) for players who know what they are doing to have edit access. There's very little error trapping so when things break, they break. The game launches but the font looks messed up (missing characters, uneven spacing, etc): ensure you are using UTF-8 in your ssh client. I really wanted to get dfhack working with this. I don't think it would take much, but I never fully scoped it out. dfhack would allow some better job management (which seems to be a common complaint of vanilla DF). I did briefly try to get Dwarf Therapist working via X11, which technically worked... but the lag was horrendous and the more I read about X11, the more I realized I probably don't want to go down that route. Feel free to expand or improve on this. I'd love to see this go somewhere. Some friends and I are working on a non-dgamelaunch setup that will hopefully be a TON easier to set up and maintain. The only downfall of this is that you're stuck with whatever fonts you have, and there aren't any decent DF fonts available. Another DFterm clone. Cool. I'll have to check this out when I get the chance. This is extremely cool but you should probably post it on the Utilities forum. I have one particular font which works quite well with Nethack in IBMgraphics mode (I use it on nethack.alt.org), and I've successfully used it with Dwarf Fortress in TEXT mode; unfortunately, it's a Codepage-437 bitmap font and thus won't work properly in PuTTY's UTF-8 mode. I'm feeling a bit ignorant here. I specified the ppk key in putty but I still just get the login prompt when I connect. What am I missing on how to create a login? After you ssh in (as ssh user dorf, using the putty key), you then need to register a player account (press R at the main menu). Then after registering you can log in (L). Then head to the DF versions menu (D) and select the version on want to play, or P for the latest version. Currently I'm only hosting 40.04. Are there any plans to update this to more current versions (such as .40.1x)?